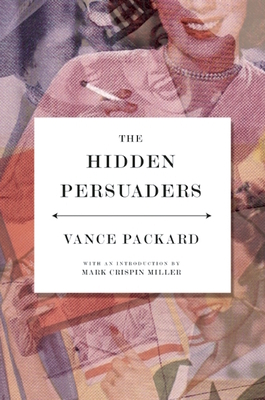 Originally published in 1957 and now back in print to celebrate its fiftieth anniversary, The Hidden Persuaders is Vance Packard's pioneering and prescient work revealing how advertisers use psychological methods to tap into our unconscious desires in order to "persuade" us to buy the products they are selling. A classic examination of how our thoughts and feelings are manipulated by business, media and politicians, The Hidden Persuaders was the first book to expose the hidden world of "motivation research," the psychological technique that advertisers use to probe our minds in order to control our actions as consumers. Through analysis of products, political campaigns and television programs of the 1950s, Packard shows how the insidious manipulation practices that have come to dominate today's corporate-driven world began. Featuring an introduction by Mark Crispin Miller, The Hidden Persuaders has sold over one million copies, and forever changed the way we look at the world of advertising. Vance Packard (1914-1996) was an American journalist, social critic, and best-selling author. Among his other books were The Status Seekers, which described American social stratification and behavior, The Waste Makers, which criticizes planned obsolescence, and The Naked Society, about the threats to privacy posed by new technologies. Vance Packard (1914 -1996) was an American journalist, social critic, and best-selling author. Among his books were the million-selling Hidden Persuaders, The Status Seekers, which described American social stratification and behavior, The Waste Makers, which criticizes planned obsolescence, and The Naked Society, about the threats to privacy posed by new technologies. Mark Crispin Miller is the author of the best-selling books Cruel and Unusual: Bush/Cheney's New World Order, The Bush Dyslexicon, and Fooled Again: How the Right Stole the 2004 Election & Why They'll Steal the Next One Too. An expert in propaganda and media, he teaches at New York University.